The new series of The Apprentice is already a man down following one candidate's decision to quit before the cameras started rolling. The man, who has not been named by the show's producers, bowed out before the first task had even been announced. Sir Alan Sugar said he had "never met the fellow" and added "there was nothing sinister about it". But in the first episode of the series, Sir Alan tells the remaining group that one of them had "bottled it" and left. Speaking to reporters today, Sir Alan said the contestant had been hit by the reality of the situation. He said: "It was just that he got himself into his hotel room that night and realised that 'this is it, 'I'm away from up to 12 weeks from my family and my kids,' and I think the reality hit home." Fifteen candidates now remain, including a former football player, a Tanzanian beauty queen and a single mother of two. Sir Alan said the departure "makes my job easier, doesn't it?" 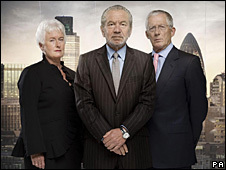 The new series of The Apprentice starts at 2100 GMT on BBC One on 25 March.